One Epworth resident arrested by police during protests. The Zimbabwe Human Rights Commission (ZHRC) has condemned the recent military crackdown on protesters and innocent citizens saying the damage to property, vandalism and incidents of looting did not warrant use of excessive force on unarmed citizens. Violent protests erupted after the workers mother body; Zimbabwe Congress of Trade Unions (ZCTU) called for a nationwide stay-away to protest against fuel price hikes announced by President Emmerson Mnangagwa. In its preliminary report, the commission acknowledged property destruction, vandalism and looting by protesters but maintains that it was not equally mean for civilians to be subjected to torture. "It is acknowledged that property including a police station, police vehicles and shops were destroyed and vandalized or looted whilst barricades were placed on roads to stop people from going to work. This however did not justify torture of citizens by the security forces as the right to freedom from torture is one right that cannot be derogated from under any circumstances," the commission said. 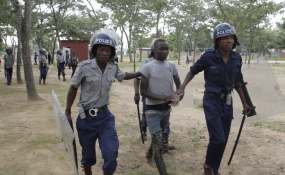 The ZHRC observed that the Zimbabwe Republic Police (ZRP) and soldiers nocturnal operations on civilians, arbitrary arrests and detention contravened constitutional duties of the law enforcement agents. "Complainants informed the ZHRC of how they were taken from their homes at night on the basis that they were males. The dragnet method did not take into consideration whether one was truly connected to the alleged offence. It is the ZHRC's strong view that police should properly investigate cases and only arrest people that have committed the alleged offences as opposed to indiscriminately rounding up citizens and taking them to courts without undertaking proper investigations," the commission said. The commission observed that the security forces violated the people's constitutional rights to privacy as police and the army personnel invaded homes and houses of people without their permission, destroying their property. "The findings reveal that in the areas monitored the police and soldiers entered into the homes, premises and property of some of the Complainants in the middle of the night without their permission. Their doors were broken into and their windows and doors vandalized by the police and the soldiers. "This violated their right to privacy which protects them from arbitrary searches of their homes and unlawful entry into their home, premises or property under section 57 of the Constitution," the Commission said. "Some of the relatives of detained juveniles who spoke to the ZHRC in Chitungwiza and Mbare, informed the ZHRC that they had been denied access to the detainees and access to information concerning the detainees, in breach of the Constitution," the commission further noted.